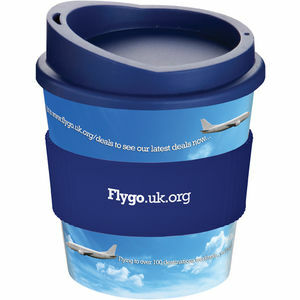 The Americano Primo Mug is ideal for getting your brand seen on desktops, around the home or out and about. This British- manufactured mug has been designed to fit within standard vending machines and has a 250ml capacity. With our Primo Mug you can choose from thirteen glossy colours, or have your full colour design moulded into the mug itself with our Brite-Americano Primo (at extra cost), ensuring your message will last for a long time. All of our Primo mugs are supplied with a silicone grip, which you can also print to, and a clip-on lid with a matt finish. The mug is BPA free and top-rack dishwasher safe.